Do not take pictures of the Chicago Jardine Water Plant as part of our “HOMELAND SECURITY PLAN”. It is o.k. if you are part of the…. Do not take cameras or take pictures so the “terrorists do not know Jardine Water Plant is located next to Navy Pier, a large tourist destination. 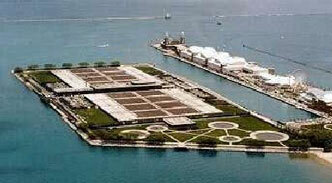 Navy Pier brings in lots of taxpayer money, said Daley. Secret photo on Internet by Water Department sub-contractor, shhhhhhh. Don’t ask don’t tell. Hey McDonough, hide the camera. I understand that the terrorist probably knows where the plant is but we don’t need him to know the layout of the plant. Its people like you that think security is a joking matter that the terrorist count on. People like you just don’t get that this is the real world and bad people are out to hurt us. I bet if you or someone you care about worked at the plant you would not be posting pictures of the plant on your site. You were not asked to put your camera away at the picnic because DWM wanted to screw with you we just don’t want to take any chances. If the people that could have stopped the tragedy on 9-11 would have done what they were supposed to, over 3000 people would still be alive today. We cannot afford to relax when it comes to security. I have children just like you and I will do anything to keep them safe. I hope you can understand that. You really are off base thinking it was all about you. P.S. Thank you for pointing out that some site are still posting pictures of the plant, we spent a year removing all pictures of the site from the net and you can be cretin that we will start the process of getting those pictures removed as well. I also am asking you that you remove the picture you have posted on your site.